The micro-ballistic experiment. (A) Scheme of the experiment. (B) Side-view image of a moving m-bullet taken by triple exposure at time steps t1-t3. (C) MLG membrane on a sample holder after α-LIPIT. Impact regions are highlighted by green backlight. (D) A schematic illustration of penetration steps. 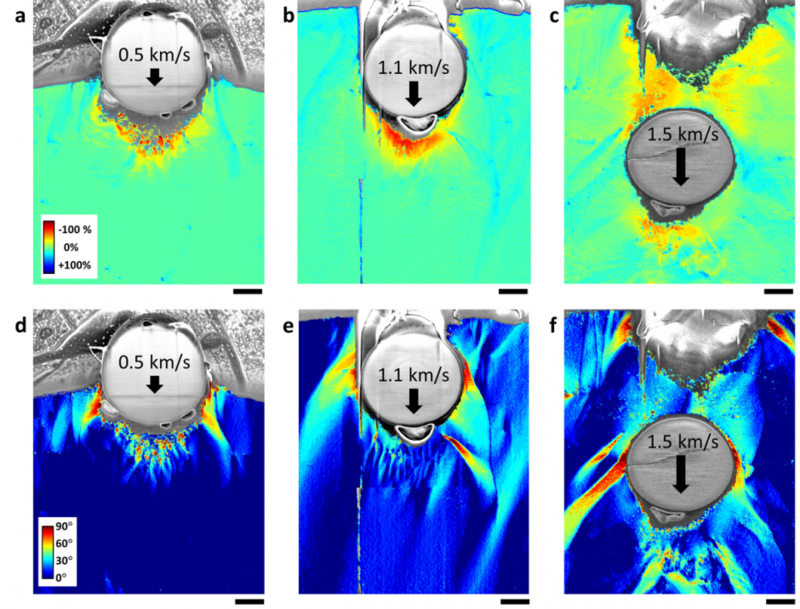 (i) Pre-penetration stage; (ii) Conic deformation stage; (iii) Fracture stage; (iv) Post-penetration stage showing the film morphology after penetration and relaxation. Scale bars, 50 µm. J.-H. Lee, P.E. 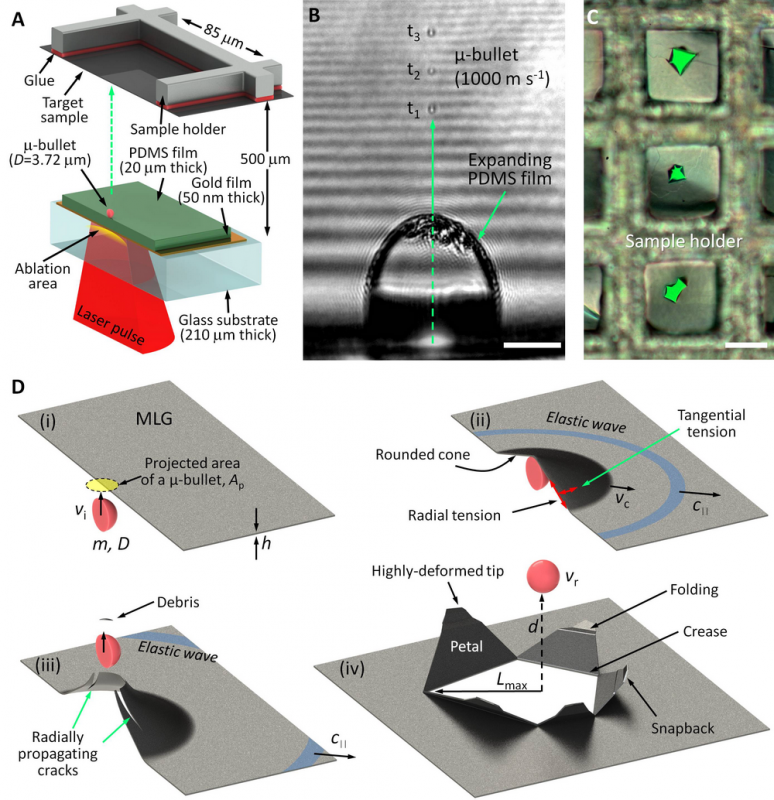 Loya, J. Lou, E.L. Thomas, “Dynamic mechanical behavior of multilayer graphene via supersonic projectile penetration” Science 346, 1092 (2014). Macroscopic ballistic impact test. (a) Photograph of a polyurethane armor disc (Cleargard®, Courtesy of BAE Systems) impacted by copper jacketed 9 mm lead projectiles. (b) Magnified view of the projectile and penetration path. The scale bar is 5 mm. (c) Schematic of the nanostructure of a polyurethane nanocomposite comprised of glassy and rubbery domains. Cross sectional SEM images of the horizontally-oriented lamellae targets for three velocities as indicated. (a)-(c) False color maps of lamellar spacing on a logarithmic scale. (d)-(f) False color maps of angular deviation from the original orientation on a linear scale. All scale bars are 1 μm. (a) Schematic illustration of the microscopic uniaxial compression experiment. 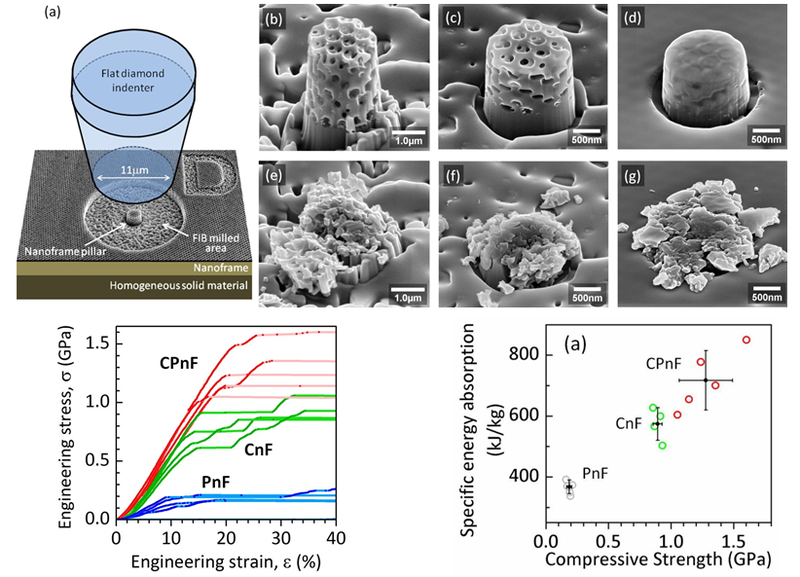 SEM images of (b) polymer nanoframe (PnF), (c) carbon nanoframe (CnF), and (d) carbon-polymer nanoframe (CPnF) pillars. (e−g) SEM images after uniaxial compression tests. Outstanding energy absorption per unit weight (or specific energy absorption (SEA) has been demonstrated. J.-H. Lee, L. Wang, M.C. 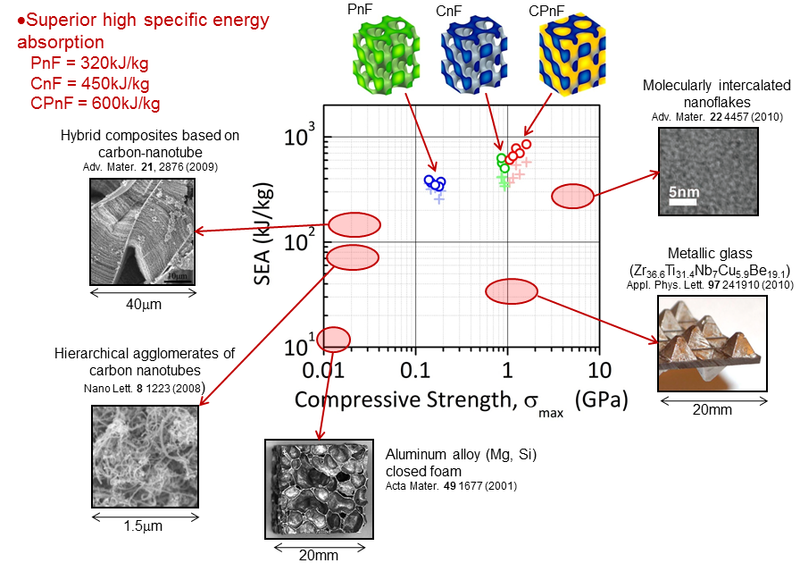 Boyce, E.L. Thomas, “Periodic bicontinuous composites for high specific energy absorption” Nano Letters 12, 4392 (2012). J.-H. Lee, L. Wang, S. Kooi, M.C. Boyce, E.L. Thomas,“Enhanced energy dissipation in periodic epoxy nanoframes” Nano Letter 10, 2593 (2010).